Now that I’m finally on the flip side of the 47,586 emails that awaited my response after BEA, I wanted to share a few thoughts about the show. For those of you who have never been to BEA, for more than 20 years IBPA has had prime real estate in the middle of the show floor. In addition to the booth that we run for our members’ titles, we also make booths available to members who want to take a larger, dedicated exhibit space for their own companies. 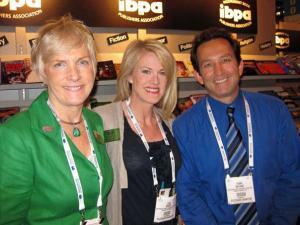 2010 was no exception—and the IBPA banners hanging from the ceiling over the aisles gave us great visibility. I liked that the show was all on one floor—previously the smaller presses had usually been exiled to a different room from the large publishers, so I appreciated the level playing field that “everybody-in-one-room” afforded to the independent publishing community. In addition to one floor, also new were the midweek scheduling and the cutback to two days (now increased to three for 2011). Personally the midweek was a little more challenging in terms of being out of the office during the workweek but it was really nice to have a Memorial Day weekend! I agreed with many others that two days wasn’t nearly long enough–our Executive Director, Terry Nathan, and I found ourselves running breathlessly from meeting to meeting. 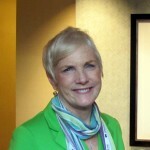 However, whether it was the two-day only aspect of the show or simply that there was a new optimism in the industry, I have to say it has been several years since I have seen aisles as crowded as they were for the 2010 BEA. The IBPA space was bustling from show opening to closing and many thanks to all of our wonderful members who helped out by volunteering in the booth. Our book signing tables in the booth were as busy as I’ve ever seen them—long lines were far from rare. We also had more publishers inquiring about IBPA membership than we’ve had in years past. And of course, the IBPA staff talked with foreign rights buyers, booksellers (yes, there are quite a few still out there! ), librarians and TV and Internet show producers. In addition, Terry and I took the opportunity to meet face to face with multiple vendors and suppliers in search of additional benefits to offer our members and possible partnerships in both educational and marketing programs. Some say that publishing industry trade shows are a thing of the past—a relic of the days when print ruled and people bought books primarily in bookstores. Others say that the number of independent bookstores has dwindled and so much buying is done online that BEA is nothing more than publishers showing their books to each other, which is an expensive luxury we can no longer afford. To paraphrase Mark Twain, I believe that reports of the death of BEA are greatly exaggerated. The show is on a learning curve and this year marked a huge step forward in terms of maintaining relevance. Our major concern as an association is to insure that the show offers enough marketing bang for the buck to make it worth our members’ bucks to attend. I believe it does. Whereas the number of bookseller attendees may be decreasing, librarian numbers are growing as are the new media, all of whom are hungry for content for their patrons, their listeners, their viewers. Librarians buy books and promotion and publicity sells books. If your books aren’t there, you miss the chance to be in front of thousands of industry eyeballs. Sure nothing may happen. But if you’re not there, nothing will happen. As I said when asked by BEA organizers for my feedback after the event, what still needs to be clarified for the future of BEA are the advantages of attending—for those inside and outside the booth. More work needs to be done in defining what the benefits are for publishers exhibiting at BEA—education, book sales, rights sales, editorial acquisition, all of those, other? And, even more importantly, what are the benefits for attendees and how can we maximize those?